To Barcelona we can arrive by AVE from a lot of different Spanish cities and we can even go to France. Within our country, we can travel with our AVE Barcelona tickets from Madrid, Zaragoza, Figueres, Sevilla, Málaga, Girona, Camp de Tarragona, Lleida, Ciudad Real, Puertollano, Córdoba, Puente Genil, Antequera or Calatayud . A place that never leaves any tourist unmoved, full of nuances, cultural knowledge, that combines modernity with tradition and culture, a place to practice all types of tourism: wine tourism, cycling, family, leisure, adventure, bird tourism, sun and beach, sports tourism, health, congresses and events... and we could describe every type of tourist and every type of tourism and Barcelona would adapt to all of the options. The station for AVE in Barcelona is AVE Barcelona Sants. The experience of discovering Barcelona can not be completed in a few hours, although in a few hours we can visit the most emblematic places of the also known as Ciudad Condal, as are the most representative works of Gaudí in Barcelona: Casa Milá or La Pedrera located in Paseo de Gracia, from where you can see its wavy façade that could evoke the waves of the sea in stone and the curious roof full of chimneys, the Sagrada Familia, the unfinished work of Gaudí and maximum representation of modernism in Barcelona, a work of great dimensions that can be appreciated from inside and also from the outside for hours, and Park Güell, another of the icons of Barcelona brought by the hand of Gaudí, again of modernist style and from which you get, in addition to being able to spend a whole day there, wonderful panoramic views of Barcelona. This famous park has been a World Heritage Site since 1984, and those who have visited it already know why: its beauty and originality are spectacular. Whether for a short break or to spend a few days in Barcelona,?the best you can do is to forget about the car, traffic jams and the search for parking or the long waits and potential delays involved in travelling by plane and book AVE tickets to Barcelona as soon as possible; on Trenes.com we have the best prices, because you will always find on our website the cheapest offer to acquire your AVE Barcelona tickets. All these AVE tickets to Barcelona are extremely cheap on our website, and we always worry about offering you the best prices and offers available at any time. The progress of tourism in Barcelona in the last century has been spectacular and today it is one of the most visited cities in the world. And as we said, it is a city that all kind of people will like because it presents an inexhaustible offer to the visitor, both day and night, both on the coast and in the mountains. No tourist or visitor should be deprived of a walk on the Ramblas of Barcelona, with its craft stands and its emblematic human statues. By the way, the tourist can see in the Portal de la Pau, at the end of the Ramblas, the Monument to Columbus of 57 meters high. Close to the Ramblas and Portal de la Pau we have the Gothic quarter. In that area, the Cathedral stands out, a Gothic building of three naves and 28 chapels. Also, thanks to our cheap AVE Barcelona tickets we can visit one of the busiest museums in Barcelona, the Picasso Museum. 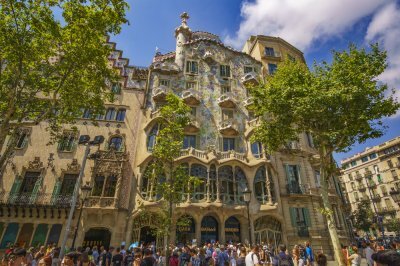 The tourism in Barcelona is not seasonal as it happens in many other places, since its climate and its wide tourist offer make it an ideal destination to travel by AVE to Barcelona and enjoy the city at any time in the year. The railway station of Barcelona Sants was built in an old railway halt on the outskirts of the city of Barcelona, specifically in the municipality of Sants. Its history dates back to 1854, when the railway line between Barcelona and Molins de Rey was set in motion, for which a station was installed in Riego Street. This line continued to grow and connect more train stations, and it was in 1967 when the current station was started to be built, located on a previously goods station. It was put into operation in different phases during the decade of the 70. The services of this station were gradually expanded, in July 1975 Sants was connected to the airport, in June 1977 the station of Plaça Catalunya and Sants station were connected, until finally putting the new station into operation in September 1979. For its construction they used mainly steel, concrete and glass. It has the ground floor, also known as floor 0 which is where most services are located (information points, lockers, toilets, etc.) and in the ground floor or plant -1 is where the tracks and the platforms are. In addition to building the station itself, a double-track tunnel was also built, which would be responsible for joining Barcelona Sants station with Plaça Catalunya station. The tunnel was divided into two sections, from the Plaça de Catalunya to the street Conde de Urgel; and from this last street to Sants. The train station of Barcelona Sants became the central station of the city of Barcelona. In 2007, and coinciding with the arrival of the AVE, some of its routes became of European width. 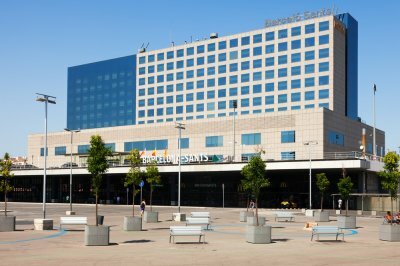 The railway station of Barcelona Sants is one of the stations in Spain with a higher volume of travellers per year. From this station there are numerous trains that cover national and international routes. It is very well connected with the rest of the city, as it has connections with various lines of the Barcelona Metro and also with the urban bus network of Barcelona. In addition to traveling in a very simple way around the city, you can also do many things near the train station of Barcelona Sants. Just across the street from the station you can find the Plaça dels Països Catalans, in this square we can find great distractions. Furthermore, very close to the station you can see the Parque de la España Industrial, an ideal place to enjoy a moment of relaxation by taking a walk along the lawn. Just 5 minutes from the railway station of Barcelona Sants is the Joan Miró Park, which has one of the largest sculptures made by this artist, as it measures 22 meters and aims to welcome visitors to the city. If you continue along the same street of the park you will arrive at Las Arenas shopping center, the ideal place for those, who love shopping. Once there, we really recommended to climb to the 5th floor and enjoy the views from the terrace. Barcelona is one of the most important cities in Europe, so it has a large number of rail connections with different points of the Spanish geography. From Barcelona you can travel to a large number of Spanish destinations, and you can even travel outside Spain, to various cities in France in particular. The railway line linking the city of Barcelona with France, known as the high-speed line Madrid - Zaragoza - Barcelona - French Border, began to be built in 1997, but it was not until 2003 that its first section, which united the city of Madrid with the cities of Zaragoza and Lleida, was put into operation. In 2006 the line was put into service up to Tarragona, and in 2008 it already arrived up to the city of Barcelona. The last section, which links Barcelona with Figueres and the French border was completed in 2013. This high-speed line linking the city of Barcelona with France is undoubtedly one of the most important of all existing rail connections, but there are many others that are equally important, such as the one that links the city of Barcelona with Madrid, which is the one with the most rail traffic. This high-speed line, as we mentioned before, was put into operation in 2008, and was one of the most expected services by the citizens of both cities. Thanks to this high speed line you can travel between two of the most important cities in Europe in a minimum time. Barcelona is one of the most popular cities among tourists. Today you can arrive to the city by AVE from various points in Spain and also from France. Also, you can find cheap AVE tickets for different routes. Come and enjoy Barcelona, ? ?a charming city, with a great cultural and artistic offer and a gastronomy that will surprise you. 100 years ago we could not have imagined that we could travel from Madrid to Barcelona, ? ?for example, in less than 3 hours without having to get on a plane. In addition, traveling on AVE offers many advantages and amenities that does not offer air transportation. Without going any further, you do not have to leave the city centre to access the starting point, as most railway stations with AVE are located in or near the centre of the city or town of origin. In Barcelona, ? ?the AVE performs its arrivals and departures in Barcelona Estació de Sants. In Barcelona there are other train stations, although they do not receive the AVE. For example, Barcelona - Passeig de Gràcia, Plaza Cataluña, Arc de Triumfo, Sant Andreu Arenal, etc. However, in these stations do not stop all the trains, as in the case of Sants. Sants was designed and later remodelled to give access to all types of trains and gauges. Not only for this reason is it the second main station in Spain. Near the station there are also many surprises and interesting things to see. If you go out the station you will see the Parque Industrial. The ideal place if you have some free time before your train is ready to depart. There you can take a walk or relax and rest before returning to the station. In addition, if you travel with children, they can also enjoy this park, there is a playground inside and a huge slide in the shape of a dragon. Also, if you have a little more time, you can visit the Parque Joan Miró. It is only a five minute walk if you continue on Calle Tarragona. This park, also known as Parc de l'Escorxador, offers an ideal place to relax. It has a wide green area from where you will be able to admire the famous sculpture of the artist Joan Miró Dona i Ocell.